"What Does America Think About the New Germany?" These articles are part of a series of posts on how The New York Times covered the rise of fascism. 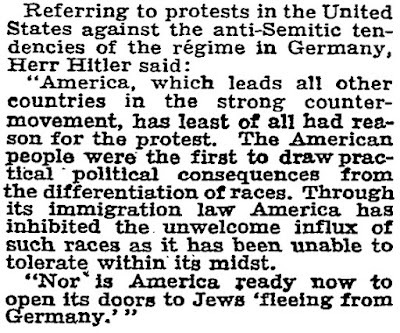 Two months after Hitler assumed office as Chancellor, The New York Times reported his reaction to American protests against the Nazi regime's rabid antisemitism. His first year in power drew international protests and a boycott on German products. The ongoing pressure threatened Hitler's efforts to consolidate power. 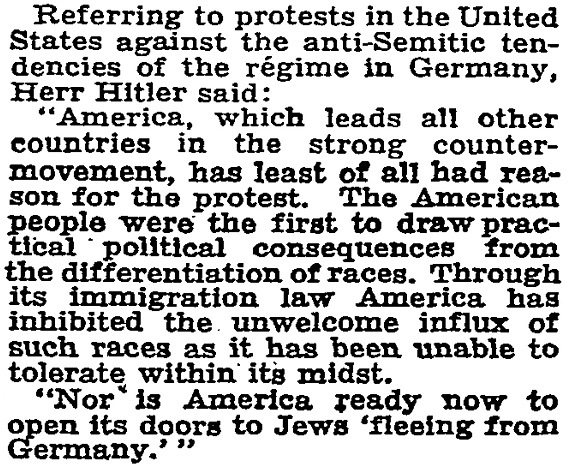 In response to American protests, Hitler attempted to downplay Nazi antisemitism and accused the United States of hypocrisy by citing its own systemic racism, particularly the country's blanket restrictions on immigration from Asian countries and its refusal to accept Jewish refugees fleeing violent persecution in Germany. BERLIN, April 6 — For the first time since he became Chancellor, Adolf Hitler issued a pronouncement on the Jewish question today, and this pronouncement was an endorsement of the anti-Semitic drive in Germany, together with a declaration that the United States had no business to protest because of its own racial discrimination through an immigration embargo. The Chancellor expressed his views at a reception to the new leaders of the German Federation of Medical Associations, which, like many other organizations, has been placed under a National Socialist commissioner. His statement destroyed the hopes of those who had interpreted his silence during the height of the anti-Jewish boycott as disapproval of it. "We must meet the natural demand of Germany for intellectual leadership according to our own kind by the early elimination of the preponderance of Jewish intellectuals from our cultural and spiritual life," Chancellor Hitler said. "True intellectual achievements have never been made by racial aliens, but always by strictly Aryan Germanic spiritual forces. "Considering the narrow confines within which German intellectual work has been restricted, our own people have an actual moral right to first-place preference. The admission of too large a number of aliens in comparison with the total number of our people might be interpreted as acknowledgment of the intellectual inferiority of our race, which we most certainly deny." "America, which leads all other countries in the strong counter-movement, has least of all had reason for the protest. The American people were the first to draw practical political consequences from the differentiation of races. Through its immigration law America has inhibited the unwelcome influx of such races as it has been unable to tolerate within its midst. 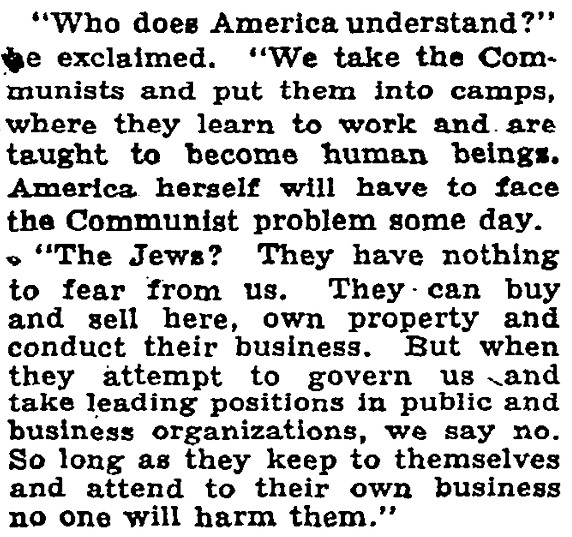 "Nor is America ready now to open its doors to Jews 'fleeing from Germany.'" The Chancellor called upon German doctors to lead in the movement to refine the German race. "The hygienic purging process now under way may not show its results for a hundred years, but our first aim is to provide a firm foundation for future political development," he said. Addressing a gathering of German provincial editors tonight, Chancellor Hitler for the first time admitted "deplorable phenomena" in effectuating the national revolution, but laid the blame on previous governments, which, he said, had pent up explosive forces in Germany, and the unsympathetic outside world, which had not recognized Germany's aspirations. Then the Chancellor told the editors that their duty was to cooperate in creating a uniform attitude of mind and will in the German people in support of the new regime. Going back to 1918 for excuses for the "deplorable phenomena" that he admitted, Chancellor Hitler declared that the repression of the national opposition to the regimes since then and the opposition of Germany's natural claims by the outside world had led inevitably to a damming up of explosive forces that in the end had to lead to a national overturn. "It was inevitable under such circumstances that developments must be accompanied by some deplorable phenomena, but these should be judged not from a static and objective standpoint, but in reference to the psychology of war," the Chancellor said. "It will be a blessing indeed if the proper insight of reasonable persons will smooth the way for the government, but it is the duty of the government to carry through the measures it considers necessary for the good of the nation even in the face of resistance." In these great days, Herr Hitler said in conclusion, the press had a mission to perform; it must recognize that it was not an end in itself but a means to an end, and this end was cooperation in creating a uniform attitude of mind and will on the part of the German people. "The right to criticism must be limited to the service of the truth!" he exclaimed. "It is quite intolerable that criticism should be turned into a cloak for treasonable attempts against the vital interests of the nation." Dr. Paul Joseph Goebbels, Minister of Popular Enlightenment and Propaganda, announced at the same gathering that a new press law would be issued soon. He said the press was "indispensable to the government forces." As evidence of this indispensability he declared that the government sought more confidential relations with the press than former governments enjoyed, and as proof of the genuineness of its wish to procure such relations he cited the fact that the government had placed the press under the direction of his Propaganda Ministry. "It will newly regulate the relation of the press to political forces supporting the State and will establish the occupation status of journalists clearly and unequivocally. It will give unto the press what belongs to the press but will also secure the government's due rights. "Like all revolutions, this one has created facts giving rise to a new legal situation. In one way or another all facts must accept this state of affairs, whether for or against the new regime. Opposition is futile. The government can only hope that the entire German press will recognize not only the irrevocableness of the overturn but also its inherent greatness and historic import. "The idea of unqualified freedom of the press belongs to that period of liberalism that we have done with. It was a notion of liberty that derived from an idea of individual freedom that really degenerated into lawlessness." Later that year New York Times correspondent Otto D. Tolischus wrote about Germany's concerns about American public opinion. He spoke with the mayor of Mannheim, Carl Renninger, who vigorously defended the Nazis. MANNHEIM, Germany, Aug. 21 — The question which the American traveler in Germany is beginning to hear more and more frequently and with an increasingly understanding tone is, "What does America think about the new Germany?" The Reich Ministry of Propaganda has given up the effort to conceal Germany's isolation, and the waves of hostility swirling around the country trouble the sleep of responsible persons, especially in an industrial town like Mannheim, where foreign antagonism means canceled orders, which in turn impede the attainment of the Nazis' prime objective, on which they stake their existence—namely, a solution of the unemployment problem. The hostility in most countries is explained by Germans, at least to their own satisfaction, as old political and commercial rivalries, but the attitude of America is watched, especially because of America's decisive role in world economy and because the Germans are convinced America is beginning to swing into the Fascist camp. The parallelism, even if there is no identity between the measures of President Roosevelt and those of Chancellor Hitler, is a favorite topic of discussion in Germany, especially among those who believe the Fascist ideology is destined to conquer the world. If told that American public opinion is less friendly, Germans point with pride to the achievements of Hitlerism—restoration of law and order, political peace, reduction of unemployment, an economic upswing and a new atmosphere of hope and national self-respect. And the average tourist might easily be persuaded of the truth of these claims. On the surface Germany never was more orderly or more peaceful than she is today. The political struggle of the last few years, which resembled civil war and took a daily toll of dead and wounded in some parts of the country, has come to an end. The Nazis rule supreme, and their rule is so firmly entrenched that they are able to dispense a constant show of force. In Mannheim, for instance, there are few outward signs of the national revolution. Since some Nazis attempted to use a hypnotic influence of their uniforms on the authorities for their own private profit, the uniforms have been forbidden except while Nazis are on duty and have practically disappeared from the streets. 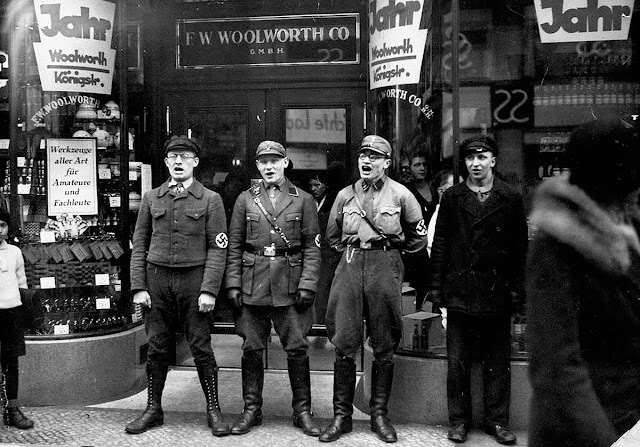 Only on Sundays, when Nazis hold propaganda marches, singing "To the Guns, People," does the new regime become more visible. To find the national revolution at work it is necessary to read the Nazi press, investigate the situation of the Jews and "Marxists," view the concentration camps, learn of the daily arrests of political opponents of the Nazis, realize the suppression of political freedom, liberty of the press and freedom of assembly, and watch the people furtively look around before talking. When responsible Nazis are told that America is unable to understand these things, the answer is likely to be the same as that given to a correspondent by Carl Renninger, manufacturer, who is now Mayor of Mannheim and who commands the respect even of his opponents because of his efficiency. "Who does America understand?" he exclaimed. 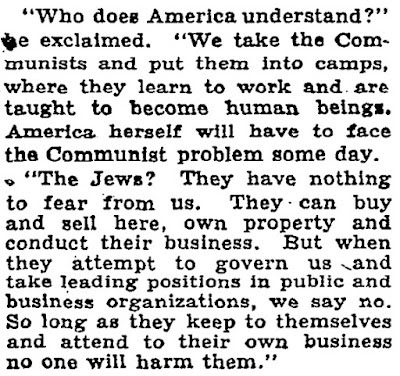 "We take the Communists and put them into camps, where they learn to work and are taught to become human beings. America herself will have to face the Communist problem some day. "The Jews? They have nothing to fear from us. They can buy and sell here, own property and conduct their business. But when they attempt to govern us and take leading positions in public and business organizations, we say no. So long as they keep to themselves and attend to their own business no one will harm them." "Well, every so often it is necessary to use a club. Some believe we are not serious and begin to resume their old ways. These must be put in their place. This part of the program will be carried out rigorously. We want the Jews to make no mistake about it. Once they realize this they will find their place and the friction will end." 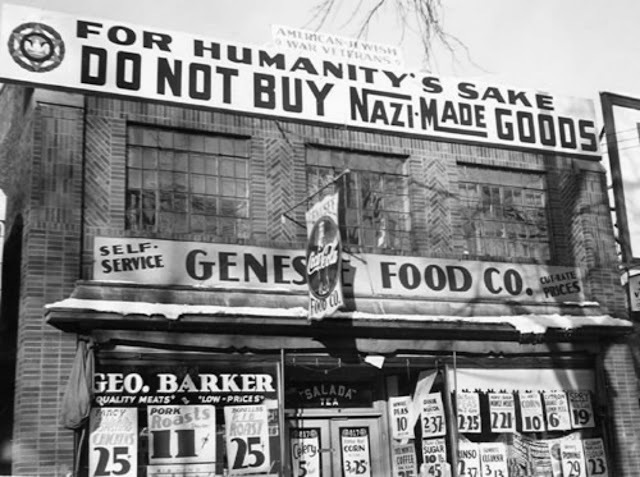 The principal aim of the Nazi regime, Herr Renninger said, was to restore confidence and order and to persuade business to go ahead with the conviction that "now is the time." "Many are sitting back waiting, saying, 'Let the State do it,'" he asserted. "This is not the idea. Help must come from private initiative. On the other hand, many projects are ripe for execution. Here is where the city comes in. We spent 20,000,000 marks annually on welfare support. Now we take the money of this fund and put it to productive work. This, together with private sums available, creates new values and puts men to work, who in turn provide employment for other men and thus start a wave of general recovery. "America has tried to start the same process by raising prices. We start at the bottom and go a harder but, we believe, a healthier road. "The best thing in the Nazi movement is idealism—a desire to do something for the sake of the idea, without expectation of personal reward. The vast majority realize Chancellor Hitler's idealism and, therefore, support him. Thank God for Adolf Hitler, he has made the German people one united nation."